I turned in my two weeks notice over a month ago. No, I didn't have another job lined up. No, one of my many malnourished ideas didn't suddenly get venture funding. No, I didn't win the lottery or have a rich aunt die. I quit because the time commitment at work began to routinely crest over 70 hours per week. I quit because there wasn't much recognition. I quit because there weren't any promotions or pay raises anywhere in site. I've been unemployed for a full two weeks now. The nagging sense that I should start sending out resumes hit me full force today. I sipped coffee in a cafe as I forced myself to half-heartedly look for openings on craigslist. After an hour or so I realized that I really didn't WANT to get a job. I really liked not feeling that Sunday afternoon anxiety born of the approaching work week. I didn't want to go back to the rat race. So I wasn't going to. The 6-year-old in me squeeled with glee, but the 25-year-old in me wondered how I was going to continue to pay off my student loans and credit card debt. I took a peak at my bank accounts, and including my forthcoming tax refund, should have enough to hold out until at least the end of June. I either had to figure out a way to become financially solvent, make the most of my "funemployment", or ideally do both. But how? After drinking much yerba mate I decided it was time to meditate on the matter. It took some time to reach, but the solution hit me like a ton of bricks: I'm going to sell my paintings. I've always loved painting - and art in general - but have never seen it as a way to survive. It's a hobby. But being exposed to so much bad art hung up in cafes, bars, and even galleries planted a secret ambition in me. 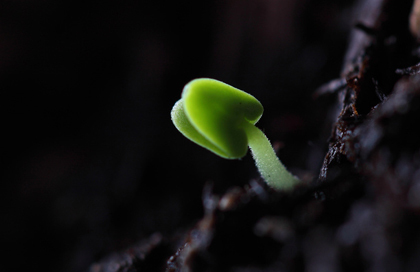 The seed of which has begun to germinate. This time off has given me a unique opportunity to pursue a dream. I've always maintained that when I strike it rich I'll retire to a sailboat and paint all day. Maybe I don't need to strike it rich first? My friends think I'm a good artist, but who knows, maybe they're just being polite. So here's the challenge: I'm giving myself one month to get my work hung, and two months to sell enough art to support myself. If nothing else, this will be an adventure.